I read this book as part of the Sisterhood of the Traveling Book Club with Kathy, Kelly & Kim. I originally picked this book to read because the new movie was coming out around the same time as our book club chat. As a group, we all pretty much agreed that the main character in this book, David, has major issues, and parts of this book were severely messed up. (I’m talking to you, Chapter 14.) We had a great discussion trying to figure out exactly why David was so infatuated with Jade, and why Jade seemed so indifferent to David. There is definitely a like/dislike relationship amongst us with this book. Some of us ended up liking it, and some of us ended up not really caring for it. I enjoy that with the book club I can ‘think outside the box’ with my reads, but next time I will definitely choose something less dark and disturbing. 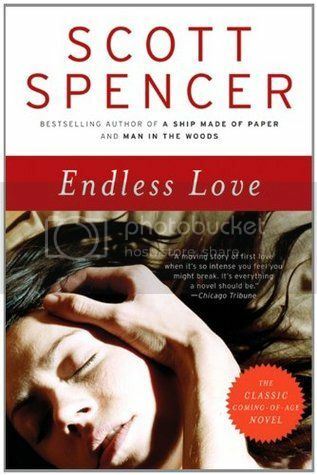 Endless Love is described as - “One of the most celebrated novels of its time, Endless Love remains perhaps the most powerful novel ever written about young love.” Unfortunately that is not what I took from this book at all. To me, this book was about an extremely unhealthy obsession and codependent relationship. I went into this book expecting a somewhat obsessive love story, and instead got something so much deeper and darker than that. I had a really hard time understanding the relationship between the two main characters. While David seemed obsessed with Jade, Jade’s feelings came across as indifferent. I’m not sure if this is because we read the novel through David’s eyes, but we all pretty much agreed that we never really got to know Jade, and she never really seemed to care for David. David, on the other hand, has a strange fascination with Jade. While he says that she is the only person he will ever want and love, I still didn’t buy the relationship. The obsession was there, but I really didn’t know what about her he was obsessed with. The writing style for the novel was very descriptive and elaborate, and the chapters were insanely long. There was so much information included in the book that I felt didn’t really need to be there, and I found myself skimming these parts more than actually reading them. There were some pretty creepy things going on in this novel, and they made me feel really weird. One chapter in the book was particularly disturbing, and no, I’m not even going to go there. The 2014 version of Endless Love movie is so very different than the book. There are only a couple of things in the movie that are similar to the book. The movie more of a sweet love story, whereas the book was more dark and obsessive. It definitely felt like the movie was geared more toward teens, and that’s totally ok. I just hope that the people that see the movie and then want to read the book after are not completely surprised. Overall; While I didn’t really care for this book, I know a lot of people really enjoyed it. Unfortunately for me, I just wasn’t able to connect with it. Check out the other book club ladies review of this book! Hum...passion needs to go both ways! Both in life and in a romance (especially in a romance!!). I didn't realize this was even based on a book. I knew the movie was a remake of a late 70s/early 80s film, but didn't realize it had source material, too. Hmmm. This doesn't really sound like something I'd enjoy. I hate reading about dark, obsessive love, but the film previews weren't looking like something I'd enjoy either, so maybe I just can't be pleased. Lol. Great review!